A unique starter that is packed full of flavour, texture and colour. Display them attractively on large serving plates and allow people to help themselves. Put the mashed potato in a medium-sized bowl, then sift in the flour and baking powder. Stir in the egg yolks and whole egg along with the crème fraîche, sage and some salt and pepper. Whisk until smooth. In a second spotlessly clean, dry bowl, whisk the two egg whites until stiff, then gently fold them into the batter. Warm the oil in a non-stick sauté pan set over a medium-low heat, then drop in a few tablespoons of the potato batter, spaced 1cm to 2cm apart. Fry for about 2 minutes, until set and the bottom has lightly browned, then turn them over and repeat on the other side. Repeat the process until all the batter has been used up. 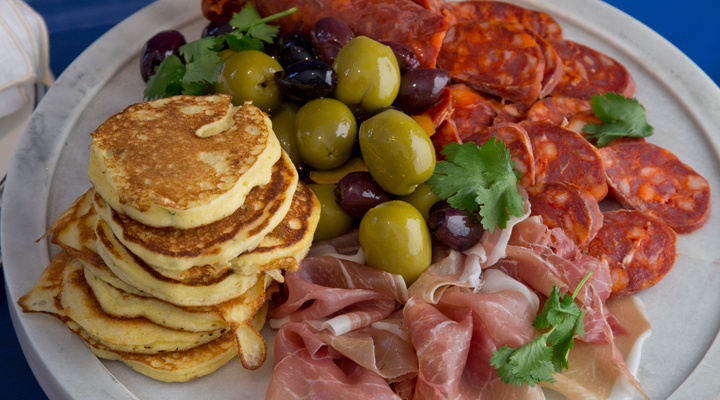 Prepare the serving platter with the cold meats and olives and garnish with a few leaves of fresh flat-leaf parsley. Put the potato blinis on the serving platter and serve while still warm.